raising teens to be successful, productive adults can be challenging! Working with teens, young adults and the adults who support them in being the best they can be! In this report, Trish shares 10 of her favorite tips, tools, resources and perspectives on topics such as growth and development, teen sexuality, academic success, risk behavior and adult-teen communication! _Changing bodies, changing minds, changing roles and responsibilities present challenges for parents and teens alike. Teen brains are developing, but aren't quite all connected to support sound decision making and support effective long term planning. Parents often report feeling resistance from their teens and teens report wanting to become independent from their parents. And while it's all pretty normal, this can be difficult and frustrating for both teens and parents at a time when important decisions are being made that can have impact for a lifetime. 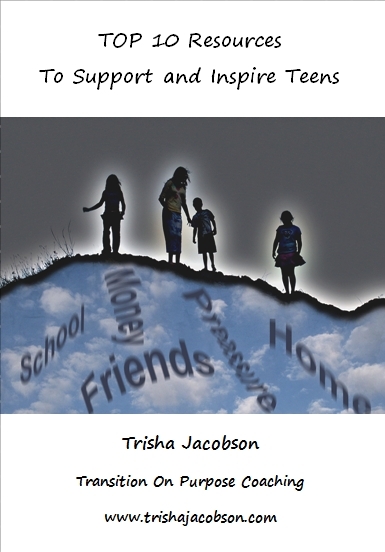 Coaching teens and helping parents understand their teens is what Trish does best! ... have trouble communicating with your teen or young adult? ... experience conflict and resistance when trying to get your them motivated or engaged? ... struggle to understand why they do what they do and act the way they act? ... find yourself tired of feeling frustrated and not knowing how to help? ... have a passion they want to pursue or a big dream they want to achieve without clear direction? ... have limiting beliefs, self esteem or self confidence issues that hold them back? ... struggling to get motivated or to stay focued? ... having trouble with relationships and friendships? ... feeling overwhelmed, stressed, anxious or wandering aimless without direction? ... interested in learning how to use intuition and inner guidance to support their decisions? ... going through a family divorce? ... going through a relationship breakup? ... going from high school to college or from school to career? ... going from court involvement, teen pregnancy, substance abuse treatment to a whole new beginning? Are you trying to find your purpose in life? Are you feeling anxious, afraid or uncertain about your future? Are you struggling with relationships, friendships and your parents? Do you find yourself resistant to any help your parents offer? Are you feeling confident in the choices you are making about your future? Coaching packages start at an investment of $597. Coaching packages are contingent upon acceptance into the program based on a 25 minute pre-program assessment to ensure coach-client compatability & coachability. Coordination with your young person's support team i.e. school, mental health services, etc. is advised but not required. Trisha is happy to discuss this further to maximize the impact of all coaching programs in the best interest of your child.